It’s not only an illegal market for elephant tusks that is putting the mammal’s very survival into question. 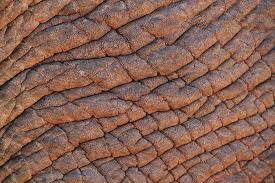 In Asia, elephant skin has also become a lucrative contraband. As reported previously in Moving Giants, elephant skin is being made into jewelry, as well as dubious skin creams and upset-stomach remedies. The issue has been particularly problematic in Myanmar. A trio of organizations — Elephant Family, Traffic, and World Wildlife Fund (each of which is a Moving Giants “Elephant Champion”) — have led the way in shining the spotlight there with undercover investigations. The investigation by TRAFFIC found that, in shops and stalls in Mong La (a semi-autonomous region of northeastern Myanmar on the border with China), the number of elephant-skin products rose from just four in 2006 to 1,238 in 2013-14. This announcement comes at the conclusion of the annual CITES (Convention on International Trade in Endangered Species) conference, held this year in Russia. Elephant Family’s undercover investigation “exposed an emerging illegal trade in Asian elephant skin,” and the sharing of Elephant Family’s findings led to action by some of the convention’s more powerful signatories. “The European Union and United States gained approval for amendments to existing text which include a requirement for investigations into illegal trade and improved reporting on implementation,” notes the Elephant Family report. The amendments will add the language “and trade in their skins and derivatives” to the wording of the CITES law governing trade in Asian elephants. “This is a big step forward for Asian elephants, since the discussion at CITES is often dominated by African-elephant ivory trade,” said Caitlin Melidonis, Elephant Family’s Conservation Program Manager. African elephants indeed have “threatened” status, but there are only 50,000 Asian elephants left in the wild, about a tenth the number of African elephants. Much of the dialogue around elephants at CITES conferences has been dominated by the ivory trade. Next week, many global heads of state will convene in London for the annual Illegal Wildlife Trade Conference, where this issue will hopefully continue to get the exposure it needs.